We’re proud to announce that Homestead is officially opening! RSVP now to join us on Saturday, September 30th from 11am to 2pm for the Grand Opening of one of the area’s most highly anticipated communities. Bring the whole family out for some Oktoberfest-themed family fun, and see what life at Homestead is like! Kids will have a blast with the bounce house, face painter, balloon artist and caricaturist. Parents will love the complimentary tastings from the New Braunfels Brewing Co., and everyone will enjoy a lunch of German-Texan fusion food from River Hofbräu, sweet treats from Kona Ice and a live DJ. And of course, throughout the event you’ll be able to learn more about the Homestead lifestyle and tour gorgeous newly completed model homes from our 3 exceptional home builders! Homestead was designed with today’s way of life in mind, from the choice of healthy-living amenities to the smallest details in each home. Nearly five miles of trails will wind throughout the community, connecting residents to nature and each other. Homestead Commons, set to be complete Spring 2018, is at the heart of the community, and will feature comfortable lounge areas and gathering spaces where residents can meet up to enjoy everything Homestead has to offer. A resort-style pool and splash pad, complete with shaded pool-side lounge areas, will make it easy for the whole family to have fun in the sun together. And, with the state-of-the-art Fitness Center just steps away, getting in your daily workout has never been more convenient. If home is where the heart is, then your home should reflect your family’s way of life. Homestead’s three premier homebuilders have gone above and beyond to provide homebuyers with tons of options to choose from so you can find the home that’s the best fit for you. Scott Felder Homes, a 10-time “Builder of the Year” award winner, offers a variety of stylishly designed homes that range in size from 2,000 to 3,200 square feet with 3 to 5 bedrooms and 2 to 5 bathrooms. Home prices start from the low $300,000s. As one of America’s largest homebuilding companies, Pulte Homes strives to provide homebuyers the quality of life they’re looking for. Homes by Pulte Homes at Homestead feature three to four bedrooms, two to three bathrooms and range in size from 1,500 to 2,500 square feet with prices starting in the low $200,000s. CastleRock Communities focuses on providing homebuyers with luxury living that will withstand the test of time. With prices from the mid-$200,000s, homes range in size from 1,600 to 2,450 square feet with three to four bedrooms and two to three bathrooms. We can’t wait to see you at the Grand Opening! 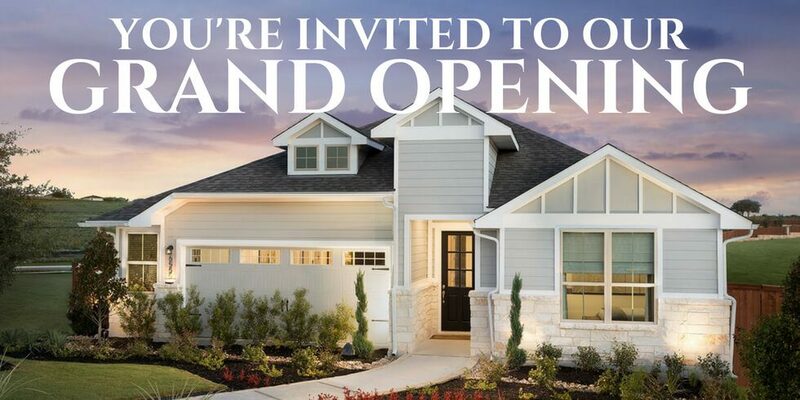 Come by for a day full of family fun and model home tours from our distinguished homebuilders. RSVP now to join us, and make sure to sign up for our Founders Club to receive news and invites to future events.